Ascendent ID announced the release of its new RFID-based load tracking system designed to automate and secure previously labor intensive and error prone transactions. 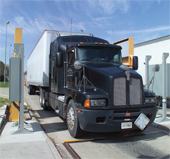 Trucks carrying product are equipped with long-range rewritable RFID tags and readers are installed at loading areas, as well as at truck scale or site exits. As the truck is loaded, product information is automatically written to the memory of Ascent ID’s RFID tag by a standalone reader. When the tagged truck approaches the scale or exit reader, a reader identifies the identification number stored in the tag and reads the memory containing the information about the product that has been loaded. This information is then sent to the customer’s system which eliminates the time and errors associated with paper tickets and key-entry. Furthermore, the driver can focus on driving the vehicle, not doing paperwork or reaching out the window to manually key-enter transaction data. Ascendent ID’s system can be expanded to provide site security for vehicle access into a plant, yard, or facility and is compatible with Wiegand and RS232 formats. Add on modules such as GPS location can provide dynamic load origin specifics for tracking by field, mine, bin, yard, or customer.